Welcome to a brand new opportunity to meet the leaders who create and drive the economy and some of the UK’s most successful businesses right here in the beautiful Highlands and Moray. 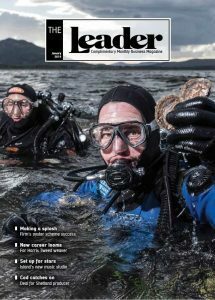 The Leader aims to get under the skin of some of the most entrepreneurial and successful people that help make the Highlands and Moray the buzzing business scene that it is today; and we search out some of the great talent of tomorrow. Our aim is to give you a unique insight into how the people who make things happen here in the north take the decisions they do; so, if you want to understand what makes them tick and what makes business in our region such a great success then The Leader is just for you. Each month we’ll meet and reveal what makes these driven men and women tick. And we’d like to know what you think; what makes our area unique, who would you like to meet and what questions would you like to ask? This is your magazine – free each and every month – so let us know what you think. We hope you enjoy it. To view issue 18, please click on the cover (right). Copyright © 2019 The Leader Magazine. All Rights Reserved.